A website selling machetes, swords and a knife "mystery box" has been criticised by police who believe one of its blades was used in a murder. Ashraf Hussan was pictured with a knife police believe he bought from the website, before he and a teenager fatally stabbed a man in Cambridge. Det Ch Insp Alan Page, who investigated the murder, was "aghast" at how easy it was to buy dangerous weapons. The store said: "All products we sell are legal and we abide by all laws." 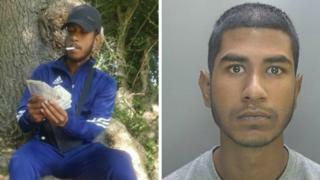 Hussan, 20, had purchased "numerous" knives from the website, including a folding knife on 13 July, Cambridgeshire Police said. Twelve days later officers believe county lines drug dealer Hussan used that knife when he and Juned Ahmed, 18, both from Newham in east London, murdered Peter Anderson. The pair are due to be sentenced on Friday. The knife sales company, which the BBC is not naming but is based in Leighton Buzzard, sells axes, "Rambo" knives and other weapons glamorised in films, such as Batman throwing knives. It also offers the chance for customers who "can't decide" to "make it a surprise" and purchase an unknown knife in a mystery box - a concept Det Ch Insp Page labelled strange. "Surely if people are going online to buy a knife to use in gardening or some sort of maintenance they know what knife they are looking for," he said. The website requires purchasers to prove they are 18 or over but the detective called for legislation to include further background checks when people purchase knives. "Yes, people can get access to kitchen knives, but why make it so easy to get these "Rambo" knives and hunting knives?" Det Ch Insp Page said. "Fair enough if someone is a tree surgeon and needs it for a legitimate reason, but someone who lives in a flat in London with no garden and no employment - you've got to ask yourself why do they need a knife such as that? "I think it's because they're going to use it for a criminal purpose." The company asks for a driving licence and for payments to be made on a pre-paid credit card which can only be owned by those aged 18 or over. But the BBC purchased a spring-assisted knife from the website using a licence with a doctored age and a debit card, which can be owned by under-18s. Company director Joseph Wheeler said there were no flaws in the firm's age verification process. The government has plans to ban the sale of bladed articles online to residential addresses and the knife sales site said it was "implementing delivery to collection points for age verification checks in person". In a statement, Mr Wheeler added: "Knives are used for thousands of legitimate purposes by law-abiding citizens. "(We) are extremely careful with our age verification checks, this is our number one priority. "Trading standards do regularly check this, and we follow all their age verification guidelines thoroughly. All products we sell are legal and we abide by all laws."